A brand new app hits the App Store with a mission to make shopping more fun, more sociable and altogether more community based. Shopping Mate is a perfect app for any stylish shopper, a shopper on the move or who's in search of advice and friendship. LONDON, ENGLAND, August 08, 2017 /24-7PressRelease/ -- The brainchild of a London businesswoman who found herself sick of solo shopping jaunts after a job change left her with no time to meet new people and look after a young family, Shopping Mate is a fun, sociable iOS app that aims to match solo shoppers with likeminded people looking to make new friends. Founder of Le Chick Productions, Alek Legosteva recruited an incredible team, including several talented female developers to make her vision a reality and help lone shoppers all over the world to find the perfect look and make friends while doing it. "When I got relocated with my job a couple of years ago, I found myself in a new place and not knowing anyone," she explained. "With two young children to look after, I had no time to go out and meet people or make new friends. I missed that social connection and realised I really, really needed somewhere to find people to do some really basic stuff like shopping together. There are loads of shopping apps for finding things and loads of dating apps for finding a partner but, very little to help those who find themselves in a situation like I did in a new place and not knowing anyone. "I created Shopping Mate to help me meet new people and to fill that gap for others who also crave a shopping buddy and second opinion when circumstances mean you don't have your network around you. It can be very lonely and my hope is that this app fills that basic need and helps users create that human connection." The Shopping Mate app is user-friendly, fun and accessible. After downloading the app, users simply log in, set up their profile based on their shopping habits, and then find people who like the same kind of things. It's easy to find shopping buddies through filters such as current location and sense of style. For those who like to mix it up and have different opinions on their potential new wardrobe options, a wildcard option makes a random pick. The virtual community concept means that someone's always there to comment on outfit photos or dressing room pictures, and the solo and group chat features means Shopping Mates can meet people from all over the world as obsessed with retail therapy as they are. Unlike other styling apps available, Shopping Mate is free and community-based. Alek and everyone at Le Chick Productions know how important it is to spend time de-stressing with friends, which is why they've worked so hard to create a space for shopping obsessives to find friends and fun even when they're on the move. Get connected and find the perfect shopping friend at https://goo.gl/iTmr4Q. Le Chick Productions is the creation of Alek Legosteva, a former employee at an IT Security firm. When the company she was working for was sold off (twice), she seized the chance to turn her dream into a reality and launched Shopping Mate. 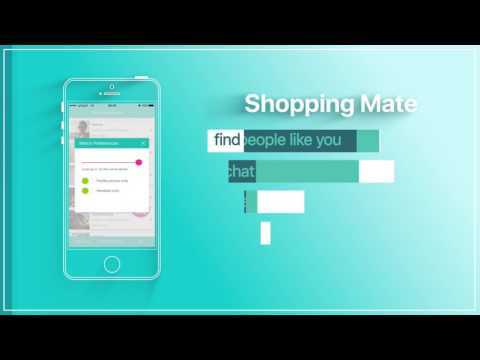 Shopping Mate is the perfect app for the stylish shopper on the move who's in search of advice and friendship. Traveling solo is one of our favourite ways to travel and it would be great to be able to find new friends through shopping!